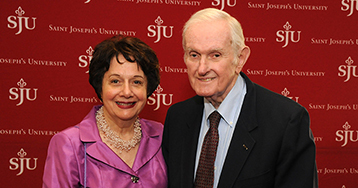 Professor David H. Burton, Ph.D., retired in 2005 after more than 50 years of building the Saint Joseph’s University History Department into one of national prominence. Upon Burton’s retirement, his colleagues wanted to honor him in a manner that would impact the History Department as much as Burton did in his five-plus decades. Burton is a beloved former faculty member with high standards who wanted to help people become their best selves. Highly respected, Burton published on Presidents Theodore Roosevelt and Howard Taft and the Progressive Era.